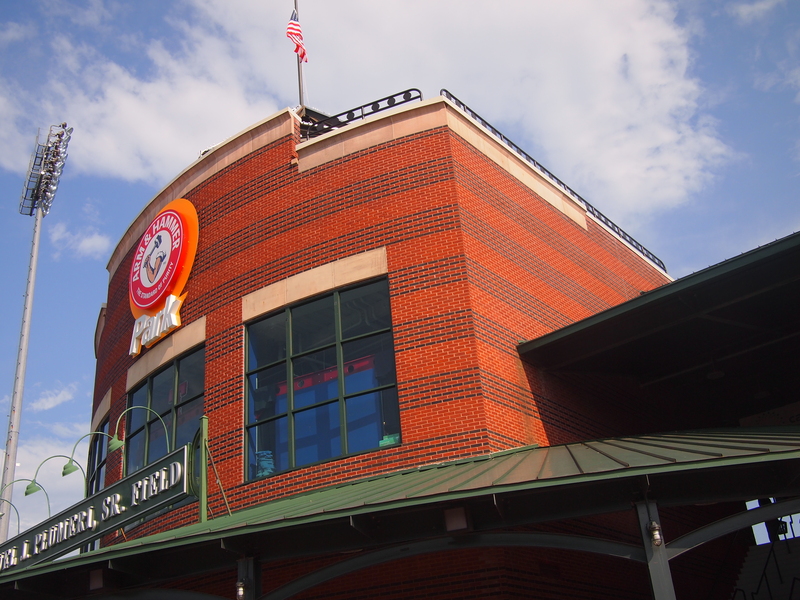 Our summer project – Jack is setting up to visit a series of minor league ballparks, interview “top prospects”, and then write an article about his experiences. He’s hoping to get it published in Sports Illustrated for Kids. Cool, right? And Alex has decided he’s going to be Jack’s photographer. Monday was our first trip: The Trenton Thunder. We actually started at my office with a string of amazingly nice people who I work with. My boss, Gerry, loaned Alex a camera. This was not just any camera. This was a high-end camera with an additional telephoto lens. This is a solid grand of hardware, and my boss is cool letting a 7-year-old use it. This filled me with terror. One of our art directors, Paul, gave Alex a 30-minute photography lesson. 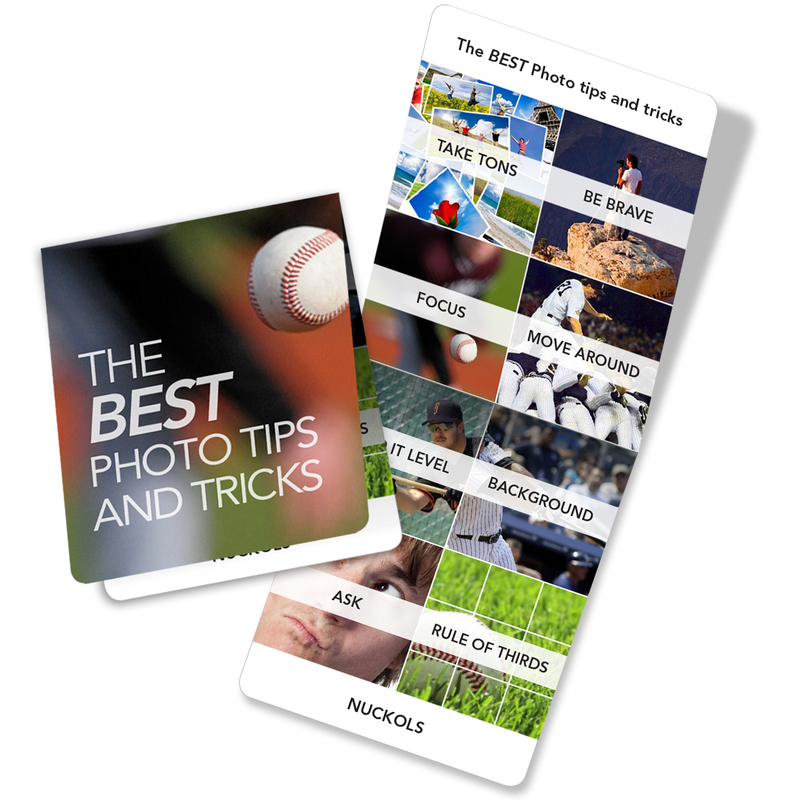 It included a series of tips, including the most important tip: “Take TONS of photos.” He even made Alex a little pocket card. 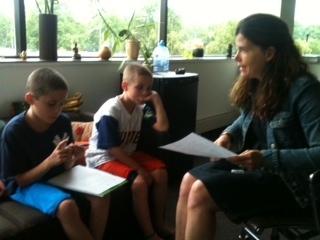 Our account planner, Diann, then gave Jack a lesson on interviewing people. They ran through his questions, practiced what he would do, got comfortable with the recorder. By 5:00 I was headed to Trenton with two boys filled with confidence and enthusiasm. We picked up our tickets and press passes at the front window, and then went inside. We had 2 interviews set up. First was with Jeremy Bleich, a relief pitcher for the Thunder. Jack did a great job going through the questions, but it was pretty obvious to me that this guy had undergone intense media training to say absolutely nothing interesting. His answers were the standard rote crap you hear on ESPN. “I just want to help the team.” “Hitter are always making adjustments, so I need to keep pushing myself to be better.” Don’t get me wrong, the guy was nice and Jack thought it was awesome. But I found his answers intensely boring. Jack actually stumped him when he asked: “What’s the craziest thing that’s ever happened to you on the ball field?” The guy literally didn’t know how to answer the question. But while Jack was asking his questions, Alex was going to town taking photos. He’d taken the lesson “Take TONS of photos” to heart. Alex spent the entire interview circling like an electron and snapping photos from every possible angle. At one point Alex actually laid down on the ground between Jack and Jeremy and snapped photos from that extreme angle. Jeremy thought Alex was funny, but Alex was not laughing. Alex was deadly serious and laser focused on his task. I spent the entire time wondering if Gerry would fire me if Alex dropped the camera. 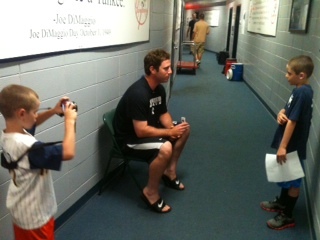 The other interview was with the Thunder broadcaster, Adam Giardino. This guy was fantastic. Adam told Jack all about his career. Adam wanted to be a broadcaster in high school, went to U Conn and became the voice of the college basketball team (including an NCAA championship), and is now working his way up the professional sports ladder. Adam shared his game notes and told Jack how baseball is the hardest sport to broadcast because there’s so much downtime. Adam works 14 hour days, regularly takes 8-hour bus trips with the team…but he’s only 24 years old and having great success. 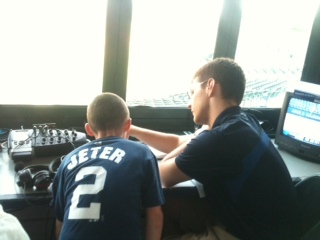 He and Jack talked for a solid 15 minutes in the broadcast booth. He was actually our host throughout the whole thing. He’s the one who set us up with the passes and the scout seats. Probably the best part was that Adam treated Jack and Alex (mind you, 7 and 9 years old) like professionals. He didn’t talk down to them and he wasn’t humoring them. He was 100% on the level. (Downside of being treated like professionals: no Thunder swag, dammit). In all honesty, part of the reason I like this project so much is because I think it’s good for Jack. Right now the entire social pecking order of 5th grade boys is based on athletic ability. Jack’s small for his age and has his father’s mediocre athletic genes. Sometimes Shani and I worry about his self-confidence. That’s really what this project is about. So with that in mind, interviewing Adam Giardino was pretty friggin’ ideal. With our interviews complete, Adam took us out to our seats. We were in “scout seats”. Interviews complete…it was time for the game. Part 2 coming soon. The “first” interview is always the hardest, but it sound like you both did a terrific job. Keep trying to think of questions that no one else has thought to ask. And Alex, keep taking pictures from every angle and viewpoint! Great job, guys!